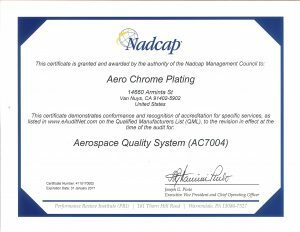 Aero Chrome’s Quality System is accredited by Nadcap, based on the AC7004 standard. 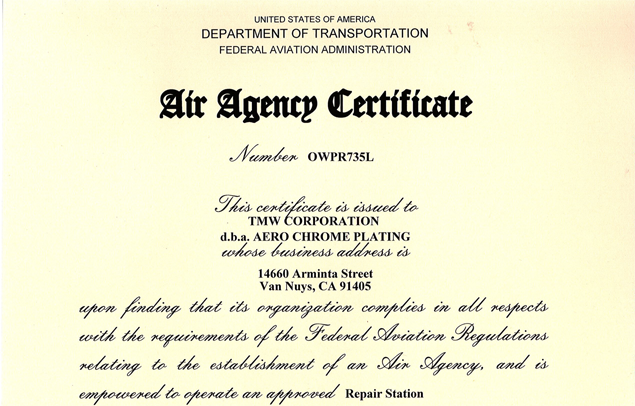 Aero Chrome Plating is proud to be on “Merit” in our NDT Nadcap Certification. We specialize in Liquid Penetrant & Magnetic Particle. Aero Chrome Chemical Processing lines are Nadcap Certified based on AC7108 criteria. 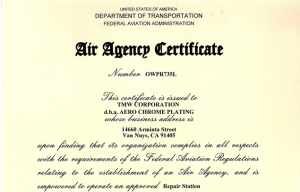 Aero Chrome Plating is an FAA Repair Station. We are a specialized Overhaul Shop. We are in compliance with all FAA regulations including but not limited to an approved Drug and Alcohol Misuse Prevention Program.